Click play on the video above to watch Coast2Coast on ABC News 19! 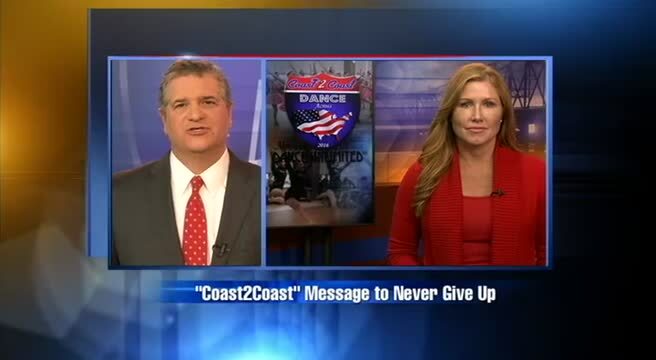 "Coast2Coast" reminds students at Misty's Dance Unlimited to never give up! "Take a dancer, a DJ, and an Illusionist and you've got Coast2Coast. A trio of professionals who give up two weeks of work to volunteer their time touring the country to instill hope in dance students. The message is very clear... If you love something, persue it with passion... and NEVER GIVE UP!" - Heather Armstrong, ABC NEWS 19. La Crosse, Wisconsin (WXOW) ---- Louie Perez is leaving in his New York dance studio to share a simple, but powerful, message with young dancers around the country. Anna Rautiola (Pictured on the right) is a student at "Misty's Dance Unlimited" and says she not only appreciates the message she gets it. "You'll always experience bumps in the road but you'll always have to keep fighting for it. You do what you love," said Rautiola. "It's just really important to Never Give Up and keep trying new things. You have to keep going no matter what people tell you" said student Macy Sullivan. Dancer Rachael Lefebere said the Coast2Coast message "applies to everything because if you don't fight for what you're trying to get at... then what are you going to do?" Perez is touring with Jimmy Lyles (a radio DJ from New York) and Ryan Dutcher; all who say they know what it means to overcome obstacles. "We give three examples of how we made it in our lives and we try to teach those kids that whether it's dance... of course we would love you to dance, but if you want to be a nurse, a firefighter, a doctor, or even a DJ... you can do whatever you want to do as long, as you set your mind to it," said Lyles. The students participate in a Master Class, receiving one hour of instruction and then perform what they learned that evening. Participation in the Master Class makes them eligible for a dance scholarship. "This is just another way to pay it forward to the world and say thank you for the success we've had. I mean they are the youth of America. Who wouldn't want to show them that they can be as successful as three normal, random individuals," said Ryan Dutcher. Perserverance, passion and positivity are also part of the dance lesson. Perez reminds students that dancing is powerful. "It's the only place in the world where you can take your audience... you can take them away for two hours of their life and you can bring them into yours," said Perez. "Perez has an interesting story... when he was ten he emigrated to the U.S. from Cuba and learned valuable lessons about never giving up. He said 'if you want something... do what you have to do. He actually mopped floors at Debbie Reynolds' dance studio in Hollywood so he could attend dance class and now, he runs a dance studio in New York with his wife." -Heather Armstrong, ABC News 19. Young dancers at an Olive Branch dance studio recently got a visit from a traveling trio of top performers on a national tour to promote dance and the creative arts. CK Dance Theatre hosted “Coast 2 Coast: Dance Across America” on its fourth national tour. The group does free dance classes on an aggressive tour that encompasses at least 21 studios across the country between its base in New York, N.Y. and Los Angeles, Calif. in 14 days. The recent visit was the group’s second time in DeSoto County, having first appeared there in 2014. Part of what “Coast 2 Coast: Dance Across America” does as a 501(c)3 nonprofit is that they award $3,000 in dance scholarship money through an essay contest, money that can be used to pay for classes at the dance studio of their choice. Made up of choreographer Louie Perez, Executive Director Jimmy Lyles and professional illusionist and videographer Ryan Dutcher, “Coast 2 Coast: Dance Across America” captivated the youngsters as they went through movements and together celebrated dance, while urging the dancers to pursue their dreams and never give up. Perez was the main dance instructor for the event and was the epitome of someone who passionately pursued his dance dreams. Perez emigrated from Cuba to California at age 10, pursued dance but could not afford to pay for classes, so he mopped studio floors at Debbie Reynolds Dance Studio in North Hollywood in exchange. Today, Perez has performed in several touring shows and owns a dance studio in Fishkill, N.Y., north of New York City. Bob Bakken is Staff Writer and may be reached at 662-429-6397 ext. 240. SCHOLARSHIP AWARDED — Taylor Pannett received a $1,000 dance scholarship from Coast 2 Coast Dance Across America Inc., presented by Louie Perez and Jimmy Lyles. WEIRTON — Taylor Pannett, 18, the child of Tim and Amy Pannett of Weirton, was recently awarded a $1,000 scholarship from Coast 2 Coast Dance Across America Inc.
Each year during National Dance Week, the Coast 2 Coast crew of Louie Perez, Jimmy Lyles and Ryan Dutcher set out on a weeklong celebration of dance, providing free dance workshops, from the Atlantic to the Pacific. This year marked their second visit to Michele Dance Studio in Weirton, where Taylor is a student. Taylor has studied all phases of dance and performed in Disney World since age 9. She has won numerous dance awards, including an invitation to the World Dance Championship in August. She represented West Virginia at the Cinderella International Pageant in Dallas, where she was a top five finalist. She is also a member of the Brooke High Dance Team and the Ohio Valley Athletic Conference dance team. Local dance studio gets visit from national tour. Dancers at a dance studio in the Coulee Region recently received a visit from some special guests. On April 27, Misty’s Dance Unlimited in Onalaska hosted the national dance tour Coast 2 Coast: Dance Across America. The tour is held in celebration of National Dance Week, as Coast 2 Coast traveled from New York to Oregon in one week. The tour was free to all studios and students involved. The tour has a goal of visiting all 50 states in a span of five years. States that will be visited this year include New York, Delaware, Maryland, Virginia, West Virginia, Kentucky, Illinois, Minnesota, Wisconsin, Iowa, Nebraska, South Dakota, Wyoming, Utah, Nevada and Oregon. The tour is made up of three men from New York who cover different fronts of dance. Louie Perez is the founder of Coast 2 Coast: Dance Across America. He emigrated from Cuba to Los Angeles at the age of 10 with little to nothing. He had a strong interest in the arts and dance but couldn’t afford dance classes. His dance teacher at the time, Patsy Metzger, decided to make a deal with him because she noticed the passion Perez had for the arts. Instead of paying for classes, Perez stayed at the studio in Hollywood once all the dancers left and would mop the floors down and clean the studio as payment. He’s come a long way since then. He’s performed in numerous Broadway tours, including “West Side Story,” “Sound of Music,” “Guys and Dolls,” “The King and I,” “Damn Yankees,” “Pinocchio,” “Seven Brides for Seven Brothers,” and many more. Perez has also owned a dance studio of his own called VP Dance Studio in Fishkill, N.Y. for 12 years. Jimmy Lyles serves as the executive director and manager for the tour. Lyles is a professional DJ and is in charge of all music for the tour. Lyles, who has a communications degree and works as a radio personality in New York, also does most of the booking and public/inspirational speaking for the tour. Finally, Ryan Dutcher works as an illusionist. He met Perez when he was a senior in high school while working on a school production. Dutcher also serves as help on the tour and knows a lot about dance since he sometimes needs them for his performances and events. Right: Louie Perez, creator of the national dance tour Coast 2 Coast: Dance Across America, shows the young dancers at Misty's Dance Unlimited new chreography. The tour visited Misty's as part of it's goal to visit all 50 states in 5 years. At the event, the three men shared their stories about how dancing has changed their lives. Lyles then told a story about a boy they had met in Kansas who was the best dancer in the class, even though he only had one leg. “I make people dance, dance is Louie’s life, and Ryan hires dancers. Dancing can get you where you want to go in life, and we want to inspire you to never give up on your passion,” Lyles said at the class. Once they were done sharing their own experiences, Perez got in front of the class and showed them new choreography and danced with them. In addition, they said they would be giving out three scholarships to students who they met during the tour. In order to qualify, students needed to attend their local tour event and write a short essay about what dance means to them. Throughout the tour’s existence, the three men have visited 39 states and numerous dance studios. Misty Lown is the owner of Misty’s Dance Unlimited, as well as the business “More Than Just Great Dancing.” This business includes more than 90 dance studios in the United States, as well as some in Asia, Australia, Canada and South America. One of the studios in New York got a visit from Coast 2 Coast last year, and after hearing how impressed the dancers at this studio were, Lown knew she wanted the group to come to Misty’s Dance Unlimited. “The lesson that they share about never giving up is priceless,” Lown said. “From solving math problems to choosing a college, our goal is to inspire these kids to keep going.” Lyles, who books the tour, said that it was the values that More Than Just Dancing instills that persuaded them to come to Wisconsin. “After speaking with Misty and researching her values and beliefs for not only young dancers but everyone in life, we felt that her outlook coincides directly with our message,” he said. Perez, too, noted that the message behind the tour means everything to him. “If one kid out of this tour gets the message to never give up, we will consider ourselves successful,” he said. While this year’s tour is over, the impact it had on Misty’s Dance Unlimited specifically is enormous. Sydney Skemp is a freshman at Aquinas High School and dance student at Misty’s. She, too, felt changed after the event. “Coast 2 Coast definitely opened my eyes to new job opportunities in the dance world. They inspired me to know that I can do whatever I set my mind to,” she said. Never give up. That was the core message of the dance workshop put on by Coast 2 Coast: Dance Across America, Inc. to promote National Dance Week, Friday at Consuming Fire School of Dance in downtown Chadron. Coast 2 Coast was founded by Jimmy Lyles, radio disc jockey and owner of Jimmy Lyles Productions, Louie Perez, owner of VP Dance Academy in New York, and Ryan Dutcher, owner of RD Illusionist. All three men found a way to make it on their own in New York City, and used the dance workshop to pass that information on. There were 10 dance students and two dance instructors who participated in the workshop, learning a short dance in 45 minutes. The goal of the workshop was less about the dance that was learned and more about teaching the young girls to never give up on their aspirations and teaching them a little bit about the different ways they could succeed in the dance world. Perez, who is originally from Cuba, was very interactive with the dance students. He talked to them before the workshop, bringing smiles to all of the girls’ faces. He was upbeat, and put every ounce of his energy into his dancing. The girls saw this, and their own energy was magnified as they followed his suit. Perez’s love for dance started at a young age, but it was easy to see that his passion has not died down. He loves dance not only for the dancing, but also for the teaching opportunities it provides. The Coast 2 Coast workshop was started three years ago because the men wanted to give something back to the dance community and do something big to celebrate the 10th anniversary of the dance studio in New York. The workshop is free to all of the students because when Perez was just getting started with dance, there came a time when he could not afford dance lessons anymore. Patsy Metzger, Perez's first dance teacher, taught at Debbie Reynolds dance studio in California,They let Perez take lessons for free in exchange for him cleaning the studio every night. Perez noted that he would not be where he is now if it weren’t for the helping hand that he received, and it is his mission to pass this on and pay it forward. After the girls put music to their dance and practiced a few times, the workshop was finished. They ended by taking group pictures, and even a selfie with the Coast 2 Coast Crew. Above: A group photo of the "Coast 2 Coast: Dance Across America" Crew with local director Jean Marie and her dancers. Left: Perez leads the dancers in stretching exercises before learning the combination. GRASONVILLE — Friday evening, April 22, Jean Marie Dance Studio hosted Louie Perez, of New York, an energetic dance choreographer who began his third annual “Coast 2 Coast: Dance Across America” tour in Grasonville before going on to his next stop in Pittsburgh Saturday. Perez, who came to the U.S. as a Cuban immigrant when he was 10 (more than 30 years ago), originally settled in Los Angeles, with his parents. In his youth, he developed a passion for dancing. His parents could not afford to pay for lessons. Through the efforts of his first teacher, Patsy Metzger, it was arranged for Perez to continue taking dance lessons by mopping and cleaning the dance floors at the Debbie Reynolds Dance Studio, in North Hollywood, California, where he began learning his skills. Right: Perez continues his warm up with the dancers, making sure their bodies can perform the fun choreography. This portion of the class lasted about 15 minutes in total. He went on to perform in numerous touring and LA Broadway shows around the nation. For the past decade, Perez has owned his successful VP Dance Academy studio in Fishkill, NY. His tour is themed, “Never Give Up On Your Dreams,” and he has student shout those words during his free dance clinics as he travels across the nation during National Dance Week. The tour promotes health and fitness along with the ideals of persistence, perseverance, passion and positivity. The tour ends in Portland, Oregon, later this week. Jean Marie Dance Studio in Grasonville has been open for the past decade offering a wide variety of dance training to both youth and adults. Owner Jean Marie, a native Marylander, performed with Debbie Reynolds in Reynolds’ dance show in Las Vegas, beginning 25 years ago. During the class, Jimmy Lyles joked "for those who don’t remember Debbie Reynolds, she’s Princess Leia's real mom" (Leia was played by Reynods' daughter Carrie Fisher in Star Wars movies). Jean Marie Dance Studio is located at 125 Pullman Crossing Road, Suite 103, Grasonville. For more information, call 410-304-2024 or go online at www.jeanmariedancestudio.com. Louie Perez; choreographer; Terry Morris, Coastal Dance Academy director/instructor; and Brittany Ziegler, instructor. In celebration of National Dance Week 2016 Coast 2 Coast: Dance Across America has embarked on their annual national tour to foster the minds of both youth and adults alike, motivating them to Never Give Up! On April 22, Coast 2 Coast: Dance Across America stopped at Coastal Dance Academy in Five Points. The tour promotes health and fitness, while encompassing the ideals of persistence, perseverance, passion, and positivity. This tour proves that ordinary people can achieve extraordinary things. The goal is to encourage everyone to live, love, laugh and Never Give Up! Besides the tour, they also will be awarding three scholarships to deserving dancers nationwide and only students who participate in the tour are eligible to apply. Their choreographer Louie Perez emigrated from Cuba to Los Angeles at age 10. He became interested in performing arts, but was unable to afford dance class. His dance teacher, Patsy Metzger, never gave up on him because she noticed his genuine passion for the arts. Instead of charging him for class, he mopped the studio floors of Debbie Reynolds Dance Studio in North Hollywood California as payment. He promised himself that if he was successful at whatever path he chose in life, he would be sure to inspire children and adults to Never Give Up on their dreams. Since then, Louie has been fortunate throughout his career performing in numerous touring/LA Broadway shows and has successfully owned VP Dance Academy in Fishkill, N.Y. for a decade. The crew is joined by Executive Director Jimmy Lyles, a radio personality on Westchester and the Hudson Valley’s Music Station, 100.7 WHUD in New York, and is a live-event DJ. Lastly, the crew is joined by friend Ryan Dutcher. RAWLINS — A non-profit group based in New York traveling across the U.S. to promote dance and an inspirational message will be stopping in Rawlins on Saturday. Dance Across America is offering a free, one-hour jazz and Latin-style master dance class for children and young adulats at Cedar Street Studio at 11:30 a.m. Saturday. The class will be taught by Louie Perez, a professional dancer and teacher who studied at a studio headed up by Debbie Reynolds. The non-profit promotes "perseverance, passion and positivity," encouraging students to follow their passion for dance "one step at a time," according to its website. Clearly, the tour is about inspiring yound dancers. But tour organizer and deejay, Jimmy Lyles, says its about more than that. "It's not necessarily about dance, it's about whatever you want to do," Lyles said Wednesday. "Never Give Up" is the motto of the tour. Lyles said everyone, including adults, are welcome at the class. Callie Taylor, owner of Cedar Street Studio, said that she was contacted by Dance Across America about a month ago. "The whole idea is to bring the community together to dance," she said.Taylor said that having three men promoting dance is a good thing, and that boys are welcome to attend, especially "boys who are interested in dance, but just aren't sure." Kids who participate in the free dance class are also eligible to enter a contest to win one of three scholarships for dance classes at their home studio.The scholarships are funded by donations to Dance Across America. To learn more about Dance Across America visit their website: www.Coast2CoastDance.org, or their facebook page. By Monroe News Staff As of Monday, August 17, 2015, 01:00 p.m.
Hannah Berry, a student at Miss Lori’s Dance Express in Temperance, was chosen as the grand prize winner of a $1,000 dance tuition scholarship from Coast 2 Coast: Dance Across America. Nearly 100 students and parents took part in the surprise presentation that took place Aug. 12 at the studio, attended by Coast 2 Coast representatives Louie Perez, choreographer; and Jimmy Lyles, executive director and DJ. Coast 2 Coast is a not-for-profit dance organization that tours the country each year during National Dance Week. As part of this campaign, the team leads master dance classes free of charge to students and their studios. One of the stops this year was Miss Lori’s on April 28. During the tour, all students who participate can apply for three scholarships that are paid in their name to their home dance studios to help pay for tuition. Out of the hundreds of students who applied, Hannah was picked as the grand prize winner. For more information, or to become a sponsor or donate to the organization, go to www.Coast2CoastDance.org. Left: DJ J S'zzle aka Jimmy Lyles, goes over instructions with students at Tonawanda Dance Arts during the program for Coast 2 Coast: Dance Across America. James Neiss/staff photographer. Tonawanda Dance Arts welcomed “Coast 2 Coast: Dance Across America” to their studio on April 27 for a day full of uplifting dance and positive vibes. This was the dance studio’s first year participating in the tour, which sees the crew, comprised of Louie Perez, Jimmy Lyles (aka DJ J S'zzle) and Ryan Dutcher, traveling across the country to teach a special master class at various dance studios during National Dance Week which ended Sunday. Twenty-four students, ages 8 to 17, participated in the free one-hour master class. The session began with each crew member motivating the students, telling them to “never give up.” They also shared some of their own life experiences, struggles and how with an optimistic approach, they each achieved their goals. After handing out colorful bracelets to each student, Perez lead the group in a warm-up that included stretching and cardio. At one point he also invited a few dancers up to the front of the room to dance a few steps with him, allowing them to show off their own moves. For the majority of the class, the students were focused on learning an energetic and jazzy hip-hop routine, which by the end they all performed with loads of energy and smiles across their faces. Dance students Jackie Eisenhauer and Whitney Zimmerman both took part in the class and said they enjoyed having Perez come in and share his unique style with the studio. At the end of the hour the students and instructors all huddled together for a photo to celebrate a successful class. The idea for “Coast 2 Coast” was first thought up by Perez, the tour’s choreographer and owner of VP Dance Academy, in November 2013 when a parent came up to him at his studio’s ninth recital suggesting he “do something big” to celebrate his tenth year. Lyles, manager and coordinator of “Coast 2 Coast,” who is also a radio DJ, met Perez and Dutcher while they were attending John Jay High School in 2005. Dutcher and Lyles were involved in several shows with their high school’s theatre group, Proscenium, including “Aida,” which Perez joined as the choreographer. Dutcher, who performs his own shows as an illusionist all over the world for a living, assists with photos, videos and the social media aspect of the tour. When Perez immigrated to America from Cuba when he was 10, life was difficult for his family at first, as they were unable to pay for his dance lessons. Despite their lack of funds, Perez’s dance teacher, Patsy Metzger, recognized his passion for dance. She allowed him to mop the floors at Debbie Reynolds Studio in North Hollywood, California as payment for class. Now the group takes their dance tour on the road every year in efforts to give back to dancers in communities around the nation. “I turned ‘Coast 2 Coast’ into a not-for-profit this year for a few reasons,” Lyles said. “First off, Louie paid for the entire inaugural tour out of pocket—from the car rental, to the hotels—everything. His whole goal is to give back. The group has luckily been given generous donations from select studios, such as Tonawanda Dance Arts, who want to help make “Coast 2 Coast” possible each year and free for students and studios participating in the event. This year the “Coast 2 Coast’ crew will also give a few hard-working dancers the chance to earn dance scholarships. Those interested in entering are required to take part in the master class, submit an essay on a specific topic relating to the tour, provide a recent photograph and show a passion for dance. There will be a deadline for the essays and the winners will be announced on National Dance Day on Saturday, July 25. Tonawanda Dance Arts, 368 Hinds St., offers a wide variety of dance classes for children and young adults, such as combination classes, tap, jazz, ballet, lyrical, musical theater, cheer dance, acrobatics and hip-hop. This summer the studio will be holding two free dance camps June 16-18 and Aug. 4-6 for those interested in trying out a few dance classes. For more information visit tonawandadancearts.com. FYI: What’s up in the dance community? Left: Louie Perez’ Coast 2 Coast tour included a stop at Dare to Dance in Cincinnati, Ohio. Studio owner Louie Perez was looking for a way to celebrate both the 10th anniversary of his VP Dance Academy in Fishkill, New York, and National Dance Week when a student’s father had an idea. “You could dance across America,” he said. So Perez did, teaching a free one-hour jazz class in 17 studios in 14 states over 12 days. Coast 2 Coast: Dance Across America kicked off March 28 at VP, followed by two classes at nearby New York studios. But the cross-country driving tour got underway in earnest on April 23 when Perez and two friends began a trek that would take them through New Jersey, Pennsylvania, West Virginia, Ohio, Kentucky, Tennessee, Mississippi, Texas, Oklahoma, Kansas, Colorado, and Nevada. The tour ended May 5 at the Debbie Reynolds Studio in North Hollywood, where, many years before, Perez had cleaned the studio in exchange for lessons. Along the way, Perez told Dance Studio Life, he made “hundreds of friends” and was inspired by many, such as a young amputee in Wichita and another severely impaired dancer in Las Vegas. The tour was “life-changing,” he said, and he is planning a repeat next year, with the ultimate goal of teaching in 50 states in five years. “You have a choice,” says Perez. “You can either sit on the couch and let life go by, or you can be proactive and dance!” For a video diary of the tour, check out www.Coast2CoastDance.org. Click the image below to see a short news clip from CBS 4 in Buffalo, NY! Left: Louie Perez poses with students at Michele Dance Studio in Weirton, West Virginia, one of the stops on his “Coast 2 Coast” dance tour. Perez is bringing the tour to states nationwide free of his charge as part of his pledge to pay back his good fortune. In the Ron Howard film “Frost/Nixon,” David Frost says, “Success in America is unlike success anywhere else.” Louie Perez can relate; his is the quintessential American story of rags to riches. Perez is a man of his word. Having owned VP Dance Academy in Fishkill, New York, for 10 years now, he is setting out on “Coast 2 Coast: Dance Across America,” a journey ranging from New Jersey to California in celebration of National Dance Week. Perez is teaching a free master class to dance students of all ages at stops in 15 states, including one at Pure Movement Dance and Fitness in Allen. Metzger, who gave Perez his big break, said she saw his passion burning bright even back then. Perez said the genesis of the idea was his wish to give back to the dance community that’s given him the life he always desired. His message to students is simple: persistence is the key to success. After visiting with Pure Movement owners Dusty Solis and Emily Scoville, Perez said they were determined to make Allen one of the stops on their nationwide tour. Join Perez at Pure Movement for an evening of positive, uplifting dance at 6 p.m. Thursday, May 1. Pure Movement is located at 1210 Main St. Suite 160. Above: Mr. Louie speaks to dancers at CK Dance Theatre in Mississippi. The reason we started this is because of a boy’s love for dance and his determination to never give up on his dream. When our choreographer, Mr. Louie Perez, emigrated from Cuba to America at the age of 10, life was hard for his family. There came a time when he could no longer afford dance lessons, but his first dance teacher, Patsy Metzger, saw his passion for the arts. She allowed him to mop the floors at Debbie Reynolds Studio in North Hollywood, CA as payment for dance class– and the rest is history! Louie set out on this journey to “pay-it-forward” through his passion of dance and is making headlines across the country with the “Coast 2 Coast: Dance Across America” Tour! Right: Hannah Berry of Miss Lori's Dance Express in Michigan is presented with her $1000 Grand Prize Scholarship accompanied by Mr. Louie and Mr. Jimmy. When you think of New York… what’s the first thing that comes to mind? Of course many will say New York City, but there are approximately 55,000 square miles in the State of New York. We live about an hour from Times Square, so all three of the Coast 2 Coast Crew members have been heavily influenced by the greatest theater district in the world! Going from “Big City America” to “Small Town U.S.A.,” we get the opportunity to see the diversity of America. Although we have many states and studios to visit within National Dance Week—when we do have a few minutes of time, we try to take in some local landmarks. We’ve walked through the gates of Graceland in Memphis and we’ve seen the beautiful Rocky Mountains of Montana. We got the chance to dance in the Four Corners of Colorado, Utah, Arizona, and New Mexico—we’ve “Viva’d” in Las Vegas and danced in North Hollywood in the same studio that Michael Jackson’s Thriller was choreographed in! We found out there was more than corn in Indiana and not only potatoes in Idaho. We got to be in Louisville for the Kentucky Derby and even stopped by that famous “Dance Moms” studio in Pittsburgh—not to mention we’ve only been at it for two years! Just like most of the country thinks New York is one big city, each and every state from “Coast 2 Coast” has something special to offer! But one thing that we all love and can agree on about getting to tour the country each year is the differences between not only the landscape of the country, but the people that you meet. Everybody has a story to tell, but you don’t always get to hear about it. Before each class we give our backstories; we’re three guys from three different backgrounds and are living proof that you can overcome any obstacle that’s in your path. Not only does this tour promote the health and fitness side of dance, but it also encompasses the ideals of persistence, perseverance, passion, and positivity. The tour proves that ordinary people can achieve extraordinary things and students learn that no dream is too large or small—you can do absolutely anything you set your mind to, as long as you work hard. What makes us unique is that participation is free of charge to students and studios nationwide and we actually get to visit, motivate, and teach at different locations across the country. This makes students more comfortable in their home studio and it also brings the opportunity to those who may not have the means to attend an additional workshop. We feel very honored to be asked to be a guest blogger for the National Dance Week Foundation. If you would like to participate or are interested in seeing more of what we do during National Dance Week, please visit us online at: wwwCoast2CoastDance.org, follow us on Instagram: @Coast2CoastDance and www.Facebook.com/Coast2CoastDance! You can also view our official 2015 Tour Video https://youtu.be/sFPx4PTAWrw. Please feel free to visit our website: www.Coast2CoastDance.org to find out more about where we have been and what we do! We provide a one hour Master Class free of charge to students and studios nationwide, all in celebration of dance and National Dance Week. Not only do we get to visit with thousands of dancers, we’re also able to award dance scholarships to keep kids dancing at their home studios throughout the country. We’re very happy to announce that our 2015 Scholarships were awarded to Hannah Berry from Miss Lori’s Dance Express in Michigan ($1000), Kallisty Adkins from Dance Attitudes in Wisconsin ($500), and Aubrie Connelly from Kathy Blake Dance Studios in New Hampshire ($250). Louie Perez, Jimmy Lyles, and Ryan Dutcher are on a mission to motivate anyone and everyone they come across. Each year during National Dance Week, the “Coast 2 Coast” Crew sets out on a week-long celebration of dance, where their National Tour sends them traveling from the Atlantic to the Pacific Ocean… "Coast 2 Coast“!The tour consists of a one-hour master dance class that is free of charge to both the students and studios nationwide but isn’t just about dance. The message is simple: “NEVER GIVE UP!” Not only do they dance and have fun, but they also motivate and inspire students to follow their dreams and always be sure to pursue something they truly love. The tour stopped in Tonawanda, New York, at Tonawanda Dance Arts, a More Than Just Great Dancing® studio affiliate. When asked why they wanted to stop at Tonawanda Dance Arts, Jimmy Lyles stated that TDA has the values they look for and they wanted to choose them to promote their NEVER GIVE UP message. Mr. Louie was born in Cuba. After immigrating to America at the age of 10, life was hard for his family. He couldn’t afford dance lessons, but his first dance teacher saw his passion. She allowed him to mop the floors to pay for his lessons, and the rest is history! The Tonawanda Dance Arts dancers had a fabulous time during Mr. Louieʼs class and were definitely inspired to follow their dreams and never give up. His can do attitude showed them that anything is possible. There were three words the 10- to 12-year-old girls of Performing Arts on Main were supposed to learn Monday. The message came from a professional dancer, a radio DJ and a magician from New York City who traveled through East Helena on their 13-day "Coast 2 Coast: Dance Across America" tour from New York to Spokane, Washington. "What I hope they get out of it is a new perspective on dance," Becky Helfert Wedll, owner of the East Helena dance studio, said about the visit. Before Coast 2 Coast's choreographer Louie Perez taught the eight girls in attendance a new dance, the team told the girls of Perez's story. Born in Cuba, Perez and his family immigrated to the United States when he was 10. Young Perez dreamed of dancing but couldn't afford lessons. So he cut a deal with a studio owner to mop the floors in return for lessons. The Coast 2 Coast tour, which is now in its second year, is his way of giving back and inspiring the next generation to follow their dreams. Jimmy Lyles, a New York radio DJ, played the music for the classes and said he represented dance by playing the music that got people going. Illusionist Ryan Dutcher told the girls that he hired dancers for his show and that anyone can pursue the different outlets for dance. "Anyone?" one of the young girls in the class asked. Coast 2 Coast offers scholarships for dance tuition at coast2coast.scholarships@gmail.com. Louie Perez, owner of VP Dance Academy in Fishkill, New York, is fulfilling the spirit of National Dance Week (April 25 to May 4) in a big way by teaching a jazz class at 14 different studios from New Jersey to California over the course of 13 days. Perez’s endeavor, the “Coast 2 Coast: Dance Across America” tour, was christened with a kickoff event at his studio March 28, but begins in earnest tonight (April 23) at 6:45pm at American Repertory Ballet in New Brunswick, New Jersey. His tour will then take him through Pennsylvania, West Virginia, Ohio, Kentucky, Tennessee, Mississippi, Texas, Oklahoma, Kansas, Colorado, and Nevada, before ending May 5 at Perez’ home studio, the Debbie Reynolds Studio in North Hollywood. Once he came up with the idea for the tour—which celebrates NDW, along with the 10th anniversary of his studio—Perez began calling studios he found online and offering to teach a jazz master class at no cost to students or the studio. Many were too busy with competition season, but others were very enthusiastic, he said. Left: Photos by Stan Carroll/The Commercial Appeal April 30, 2014 - Dancing since he was three, five-year-old Garland Gaines keeps up with the older dancers at CK Dance Theatre during a recent session with New York dancer and choreographer Louis Perez. To celebrate National Dance week, Perez and his team have been traveling coast to coast teaching free master classes, including CK Dance Theatre in Olive Branch. As the dancers at CK Dance Theatre in Olive Branch shimmied to Ricky Martin’s “Loaded,” Louie Perez saw his dream being fulfilled. Perez, the owner of VP Dance Academy in New York, decided to celebrate his 10th anniversary in the industry and also National Dance Week by traveling from the East Coast to the West Coast in eight days. Along the way, Perez and his team stopped at dance studios in 18 states to teach a master dance class free of charge to the students. His recent stop in Olive Branch was his 10th stop in his inaugural “Coast 2 Coast” dance workshop. “My goal is to encourage everyone to live, love, laugh, be healthy and never give up. I want to spread my joy and passion for dance with everyone across the country. We will do this one dance step at a time,” said Perez. Perez, who immigrated to Los Angeles from Cuba when he was 10, began studying dance when he was 21. He was taught by choreographer Patsy Metzger at Debbie Reynolds Dance Studio in North Hollywood. To pay for the lessons, Perez cleaned the studio. After appearing in award-winning shows ranging from “West Side Story” to “Sound of Music,” Perez opened his own dance studio in Fishkill, New York, in 2004. Traveling in a rented Nissan Altima, Perez — along with his DJ, Jimmy Lyles, and Illusionist Ryan Dutcher, who helps video the dance workshops — began their cross-country trek when National Dance Week kicked off April 25. It ended Sunday. Last week, the trio showed up at CK Dance Theatre, the newly opened dance studio owned by Southaven Alderman Kristian Kelly and his wife, Cristina. Perez said they Googled dance studios across the country and then called to see if they could stop in and teach a free one-hour class. Cristina Kelly, who is the director and one of three instructors at CK, said she had a ton of questions to make sure Perez and his crew fit in with their Christian-centered studio that opened in July and already has 256 students enrolled in their classes. After hearing Perez’s story and seeing him giving back to young dancers, CK Dance gave the “Dance Across America” team the thumbs-up to come to their studio on Goodman Road. On a recent Wednesday night, more than 30 students were ecstatic as Perez taught them a jazz dance routine to Ricky Martin’s Latin-infused music. Five-year-old Garland Gaines, who has been dancing since he was three, said he loved the class. “It was fun, but I am tired,” Gaines said after the hourlong class. Left: Louie Perez, front, recently hosted a class at Showstoppers Dance Studio as part of his “Coast 2 Coast: Dance Across America” tour. It started in a small rental space at a shopping center. Since then, there’s been no holding back for Showstoppers Dance Studio. Showstoppers, 724 E. Krayler Ave., is celebrating its 30th anniversary this year. At 7 p.m. Friday and 2 p.m. Saturday, the studio will put on a recital to commemorate its 30 years of business. Titled “Showstoppin’ for 30 Years,” the recital will be at the Stillwater High School Performing Arts Center. The dance studio has experienced a great amount of success, said owner Tracy Frazier. “I started it my senior year of college; I was in the Rosewood Hills Shopping Center, just rented a space in there,” Frazier said. “The first year, I had 100 students. The second year I increased 50 percent, and the third year I increased another 50 percent. Frazier’s business didn’t stop growing, and by the 10th year a new studio was needed at its current location. Now, Showstoppers is going out of state and around the country to showcase its students’ talent. “In January, we went to the Sugar Bowl and performed; we got invited in August of 2013 and took 18 girls,” Frazier said. “That was pretty neat because they got to experience some things in New Orleans, the Mardi Gras world. Frazier said Perez is choosing one studio in every state so he can literally say he went coast to coast. Showstoppers got to participate in early May, Perez’s first year, and had 35-40 girls at the studio for his class. The recitals this weekend will differ from most recitals, mainly in the sense of timing. Frazier has always run her shows like a Broadway show, which she says keeps fathers, brothers and men in general from getting bored. She expects the show, which consists of 44 dances and a 15-minute intermission, to run just two hours and 15 minutes. The junior and senior dance companies, which run from sixth to eighth grade for juniors and high school to college for seniors, have always placed in the top-three of regional competitions and have been invited to nationals. Showstoppers chose not to go to nationals this year because of the several events it has participated in, and next year’s planned trip will make the performance at the Sugar Bowl in “The Big Easy” look like a slice of cake. On Thanksgiving 2015, Showstoppers is slated to perform in the Macy’s Thanksgiving Parade in New York City. There’s no question Showstoppers has been extremely successful in all ventures, and it all started with Frazier’s vision 30 years ago. “When I started this business I had many goals, but the most important to me is the obvious – to be a good dance instructor,” Frazier said. “Dance is an art, so it is a challenge to get your meaning across in a way that everyone can understand and do in harmony. OLIVE BRANCH — Louie Perez was once a poor immigrant who wanted to dance but didn’t have the money for lessons. His dance instructor, Patsy Metzger, saw the determination and potential in Perez and gave him lessons in exchange for his cleaning the studio. “There was a time in my life where I couldn’t afford to pay for dance class. I had people behind me who never gave up on me and pushed me to follow my dreams. I went from cleaning Debbie Reynolds Dance Studio in North Hollywood to owning my own studio with nearly 300 students.” Today he is a successful dancer and actor on both stage and screen and owns his own dance studio, VP Dance Academy in Fishkill, New York. To celebrate National Dance Week, April 25 to May 4, Perez and his support team are travelling across America from Time Square to Los Angeles giving free master dance classes at dance studios. Jimmy Lyles added, “I told him ‘you can’t walk the mall’ so literally dancing across America would kill him.” After discussions with his friends and his wife Francine, Perez came to the conclusion that a free master class would be the best way to give back and Dance Across America was born. “He’s doing this free of charge— free to the students, free to the studios,” Lyles said. The process of selecting dance studios then began. “We were up at three a.m. sitting around a dining room table with Dunkin Donuts, Googling dance studios. We looked at studio web sites and their philosophy. CK (Dance Theatre in Olive Branch) stood out because they fit our message. Their philosophy is our philosophy.” Perez agreed, saying “It’s funny how God lays out a path. A year ago if you had told me that I would be doing this, I wouldn’t have believed it.” Perez’ team consists of Lyles and illusionist Ryan Dutcher. Perez choreographs dancers for Dutcher’s stage show. The Dance Across America team is paying for this tour themselves. “Louis is funding this — he has no sponsors.” Dutcher said. While Francine Perez runs the studio back home in New York, Perez, Dutcher, and Lyles are driving through 18 states bringing Perez’ message of “never give up on a dream” to the classes at selected studios. “We’re not here to judge them (the dancers)," Dutcher said. "We’re here to celebrate them and celebrate dance. It’s about health and fitness and never giving up on a dream," said Lyles. WEIRTON - Louie Perez, VP Dance Academy owner, will stop at Michele Dance Studio April 28 to give a master dance class free of charge as part of his "Coast 2 Coast: Dance Across America" celebration during National Dance Week. Perez immigrated to Los Angeles from Cuba at age 10 and began studying dance at the Debbie Reynolds Dance Studio under Choreographer Patsy Metzger. In order to afford lessons, he cleaned the studio. Perez enjoyed a career in musical theater appearing in award-winning shows including “West Side Story,” “Fiddler on the Roof,” and “Sound of Music.” He moved to Fishkill, N.Y., in 2004 to open his own dance theater. Miss Lori's Dance Express of Temperance will host a visit on the Coast 2 Coast: Dance Across America tour on April 28. This event includes a master class at 7 p.m. in which more than 100 students ages 8 to 18 are expected to participate, according to Lori Fain from the dance studio at 7200 Lewis Ave., Suite C2. This is the second annual national tour for Dance Across America, intended to motivate both adults and youth to "Never Give Up!" The tour from New York to Washington State was scheduled in conjunction with National Dance Week, which is April 24-May 5. The Coast 2 Coast choreographer is Louie Perez, dance teacher is Patsy Metzger, touring with with Jimmy Lyles aka DJ Sizzle, and illusionist Ryan Dutcher. This class is offered free of charge to the host studios and their students. The class emphasizes the health and fitness side of dance, while encouraging "persistence, perseverance, passion and positivity" among dance students. Coast 2 Coast is a non-profit organization that runs on donations, its outreach efforts include providing scholarships to dance students across the country. For information about the organization or its tour, go to www.Coast2CoastDance.org. Atarrah Brunko, 11, dances with Coast 2 Coast Choreographer, Louie Perez at Dance Theatre Northwest, Tuesday in Rathdrum. Dance students received a hour-long master dance class from the professionals. The Dance Theatre Northwest dance class warms up with Dance Across America's Coast 2 Coast crew Tuesday in Rathdrum. The dance studio is one of the crew's 18 stops across the nation.